The 2nd U.S. Circuit Court of Appeals in Manhattan ruled Monday (12/21/2009) that it must defer to the so-called expertise of the U.S. Nuclear Regulatory Commission (NRC) -- a small cadre of pro-nukers which sort of pretends to regulate the nuclear industry. And it gets worse: The court could have, perhaps, somehow, rejected the case, or claimed they didn't have jurisdiction. Instead they took on the case, and then abdicated responsibility. They said, in effect: "We'll rule, but we'll rule in favor of the NRC every time." Such momentous things are often reserved for holidays, when the fewest people are paying attention. The specific topic was an attempt by several states to force the federal government to admit that spent fuel pools at nuclear reactor sites are a serious environmental threat. But even that was too much for the courts. "Ignorance is no excuse in the eyes of the law." Well, it appears that, as unbelievable as it may sound, the law itself (i.e., the court system) is allowed to be ignorant! As long as there's a government agency which claims to understand something, the legal system no longer has to understand it. Not the nuances. Not the scientific foundations. Not the political ramifications. Not the economic factors. Not the alternatives. They just don't have to understand stuff anymore. Calling in so-called "expert" witnesses won't be allowed -- unless they work for the Federal Government and are stating the opinions (taken to be facts by the court) of the agency they work for within the government. And they can telegraph that opinion to the court by their actions -- they don't even have to show up. And you can't fight it -- the court will rule in favor of the opinion of the federal agent in every case, without further exploration of the facts. That's what happened in regards to the opinions of the Attorneys General of three states -- Connecticut (where this author was born), New York, and Massachusetts. The lawsuit was based on a request by Massachusetts and California (where this author resides). The four states involved represent about 1/5th of the population of the United States -- about 65 million people. About 65 million Americans are not entitled to an opinion. And neither are the rest of you -- you just didn't try to offer one, so you didn't find out you're not entitled to an opinion, either. Taking the NRC's opinions as fact is essentially the same as allowing the nuclear industry to define the so-called "facts." The U.S. nuclear industry is almost entirely self-regulated, which means it hides things from the federal inspectors, who don't have time to look at more than about 1/10th of 1% of what goes on at the plants. These so-called "experts" are stretched thin as ice, as they ponder dozens of new designs to replace our aging and dilapidated "fleet" of 104 reactors -- aging, collectively, at the rate of 104 reactor years per calendar year. As Neil Young said, "rust never sleeps." New reactors are not permitted in California, after a landmark case fought decades ago by Jerry Brown against the federal government of the time. Brown won for California the ability to stop NEW nuclear reactors in the state until the spent fuel (aka nuclear waste, "quap," and many other names, some not nearly so benign-sounding, and thus, more appropriate) problem is solved. This landmark case has stood the test of time in the courts thus far. The latest challenge came just a few years ago by a crazed group out of Fresno who want to build a new reactor, and who have a state assemblyman -- a know-nothing who bases his opinion on campaign contributions instead of facts -- who wants to help them. That attempt failed (so far; it could be revived), but there have been a few problems -- a few chinks in the armor -- which the nuclear industry has capitalized on to the fullest extent of the law (and beyond). When the California law was enacted it was believed by the duped and, for the most part, ignorant citizens that in a few years, the operating reactors would get too old to operate and be shut down. One chink is that old reactors can be rebuilt over and over again umpteen times -- forever, if it's okay with the NRC (those "experts" who have just been given a free hand by the courts). But here's another chink. San Onofre Unit 1 was shut down in the early 1990s for various reasons, but mainly because it simply wasn't cost-effective to operate. But Unit 3 can be reopened. The license can be restarted. The reactor itself cannot -- so-called dry casks sit on the hallowed ground on which it stood, and the reactor dome has been demolished, ground up, hauled away, and washed out to sea. The reactor pressure vessel sits attached to nothing, like a heart removed from a body, shielded by a specially-constructed building and its own 8 inches of steel, the inside being far more radioactive than the outside, but none of it good. Meanwhile, you're worried about health care reform? It's better not to get sick in the first place. Nuclear waste is so dangerous, that millions of people could be wiped out in a spent fuel fire. Millions more would suffer lifelong debilitating illnesses. Crops, water, soil -- all would be nearly permanently damaged by a spent fuel fire. Damage estimates are that health effects will occur as much as 500 miles "downwind." Trillions of dollars would be lost if San Onofre or Diablo Canyon, or Indian Point, or any of the others were to have an accident in their spent fuel. Never mind the reactors, we're JUST talking about the spent fuel. The part that's growing, in California alone, by about a thousand pounds PER DAY on average (we have four reactors in California, with a constant threat of a fifth and perhaps a sixth (Humboldt County had a reactor at one time, and could legally be "restarted" although like SONGS' Unit 1, it doesn't actually exist much, anymore). The Nevada Test Site (NTS), where Yucca Mountain is located, isn't as big and vast as you might think. Sure, hundreds of nuclear weapons were exploded there above the ground, and hundreds more below it. But they tried to conserve space as much as possible: Bomb blast craters frequently overlap each other at their edges, and many of them are small, as atomic bomb craters go. I flew over it once. It's terrifying, but it doesn't go on "forever." The radiation from those bomb blasts will go on for millions of years, which is close enough to forever for all reasonable economic, political, and most other projections. Hundreds of thousands of American soldiers were harmed by that radiation when they were forced to walk through the radiation fields soon after a bomb had gone off, or forced to witness a bomb blast up close (or, more frequently, told to look away and cover their eyes with their hands, in which case they would see the bones of their hands when the bomb went off, from the x-rays running through them). Millions of ordinary citizens were exposed to the fallout from those tests, too. A nuclear power plant has a thousand times MORE radiation than a nuclear bomb! If a spent fuel fire occurs, the radiation content of DOZENS of refills of the reactor -- thousands of nuclear bombs worth of radiation -- could be released into the world. Millions would die, and millions more would suffer. Trillions of dollars in real estate and other property would be lost forever. Experts by the thousands have tried, over the years, to solve the problem of what to do with the nuclear waste. But believing it can be solved at all is a bit like believing in Santa Claus. No, actually, it's a lot like believing in Santa Claus. Sort of a reverse-Santa, who can magically come and take away your icky garbage that you don't know what else to do with. The "solution" to nuclear waste has defied mankind for 60+ years, and this "trend" will continue forever. That's not exactly a prediction, any more than predicting that gravity will continue is much of a prediction. The reason there is no solution to nuclear waste storage is that radiation destroys ANY container you put it in. Containers are made from chemical bonds, which are much weaker than radioactive decay forces are. Case closed. Ah, but wait! The case -- the legal case -- cannot be opened, because the courts have ruled that they don't have to understand this stuff. They don't have to understand the energy spectrum, or the nature of matter, or elements, isotopes, molecular biology, or why infants are more at risk than adults from radiation damage. Nope. Instead, the Nuclear Regulatory Commission is the ONLY expert the U.S. court system will accept -- yet the NRC doesn't have a single medical doctor on its staff, let alone one who is an expert in the health effects of radiation on fetuses. The agency is woefully deficient in understanding metallurgy, too, which is why they have let reactors be built with parts that fail far sooner than expected. It's an industry-wide ignorance, costing hundreds of billions of dollars all around the globe, even without an accident. And as for human engineering factors -- the NRC will let you get away with anything. They basically just keep on thinking -- no matter what evidence there is to the contrary -- that workers at the plants, who have passed a variety of security checks to be there in the first place, will all do good work all the time. The NRC assumes that any errors that do occur will be caught by the regulators (themselves), and all such errors will be innocently made, and not intentionally covered up. The NRC fervently believes that nothing significant will be overlooked for any reason: Overworked staff, intentional cover-up, ignorance. The NRC has infinite faith in human nature, despite all the evidence they've collected over the years, such as welders who use incorrect computer-control inputs to set the speed of a welding machine's advance while fabricating a spent fuel dry cask on which the lives of millions will rely. The NRC has done everything it can to ignore the obvious consequence: EVERY WELD, at least every weld by that welder, needs to be re-inspected. But the dry storage casks that were welded incorrectly are now already in use -- full of extremely hazardous nuclear waste. Worse than that, the NRC isn't even trying to punish San Onofre's owners, where the incident occurred. The worst thing that happened in regards to the incident wasn't even the incident itself. It was the cover-up. Southern California Edison didn't really mind hearing from one of its senior managers that one of his workers had entered the wrong data. They just blamed the manager for not keeping an orderly operation. What SCE didn't like hearing was that the welder had intentionally used numbers he knew were outside of specifications. The manager who reported that had approximately 25 years' experience at San Onofre, and before that, worked at one of our national weapons labs (Los Alamos). He was considered one of the best dry-cask fabricators, if not THE best fabricator in the business. Yet SCE chose to try to destroy his career for reporting something the NRC would come down on SCE for, rather than face the problem he reported, take the heat, and let whatever the lap-dog agency, the NRC, decides to do, happen. Even if it cost SCE millions and shut them down. Instead, Southern California Edison's senior management decided to make the manager not use emails for his complaints (he had to submit them as hand-written documents ONLY), they excluded him from virtually all contact with even his boss, let alone other senior plant officials, and they tried to cover up the very existence of the original complaint by wording all reference to the incident incorrectly, and in such a way that the manager, not the worker, was entirely to blame, and then only for sloppiness, not for any intentional wrongdoing. The manager, Rick Busnardo, had wanted the welder fired. Everyone at the NRC and in the nuclear industry always says that where nuclear power is concerned, we can't cut corners. But we do. In America, as of Monday, December 21st, 2009, winter solstice, knowing the law, knowing the facts, and knowing the science, is not good enough. To be an expert on nuclear waste, you have to work for the Nuclear Regulatory Commission, and by so doing, you are automatically an authority on all issues you choose to adjudicate on, or that the courts feel are too complex for juries and judges to understand and thus throw at you, whether you like it or not. The NRC's opinion stands next to God's as the final word, and no scientific understanding of the facts matters. There are no experts but the appointed and anointed officials of the NRC. Merry Christmas! You might as well believe in Santa Claus! >What's a little nuke fire here and there? >NEW YORK -- A federal appeals court has refused a request by several states to force the Nuclear Regulatory Commission to declare spent fuel pools at nuclear power plants a serious environmental threat. >The 2nd U.S. Circuit Court of Appeals ruled Monday in Manhattan. It denied appeals by New York, Connecticut and Massachusetts that it review the NRC's rejection of a request by Massachusetts and California that it raise the risk level. >The states had argued that spent fuel causes a greater risk of fire than previously appreciated. The appeals court said it must defer to the regulatory agency's expertise. >Connecticut Attorney General Richard Blumenthal said he will continue legal actions to force the agency to create a central national site to store nuclear waste. How in the world DOES the NRC measure risk? The Penn State Breazeale Reactor (PSBR) has been relicensed for another 20 years (see World Nuclear News article, shown below). It's only used part-time. It does not power the campus. It does not provide medical isotopes. Much of its use now is just for "operator training" which is better done at other, more modern facilities (PSBR is the nation's oldest operating reactor). Many university reactors are only operated part-time, because there really aren't that many people who want to go into nuclear reactor operations these days. Some so-called "basic research" is done with the Penn State reactor, but that research could easily be done elsewhere (if it's even worth doing). Like any university, Penn State wants to be on the forefront of everything. But this? In 2005, during the reactor's 50th anniversary, the university applied to renew PSBR's license for another 20 years. If the license application hadn't been made during the hopeful Bush era, perhaps the trusties of the educational institution would have let it lapse in 2009, since the nuclear renaissance has been exposed for what it really was: Just another attempt to steal hundreds of billions of dollars from the public, by the utilities who won't pay a dime themselves for new reactors, or for insurance, or for waste management, or for terrorism protection, or for metallurgical studies, or for health studies, or for new evacuation assessments in view of new population figures, or for modern earthquake studies, and on and on and on. What renaissance, indeed? But in 2005 the show was in full swing. We were told that scores of new reactors were going to be built all over America, and hundreds more around the world. Most of those schemes have already fallen through, and most of the rest are in big trouble, because financially, NO ONE CAN JUSTIFY A NEW NUKE. If you don't believe me, you only need to read the Wall Street Journal's many articles more carefully... Or many other financial assessments. So who needs Penn State's old reactor? Nobody, that's who. But in any given year, as with all the old commercial reactors, it's easier to just keep it going than to close it down and decommission it once and for all. And the trusties probably wonder: What if, say, next year, there IS a nuclear "renaissance"? Penn State might be left behind! And so, Penn State's old reactor will continue to create nuclear waste so that a few scientists can use it during regular school hours, and a few reactor operators can be trained, and if a terrorist wants to destroy State College, where I used to live, the reactor will be there as a sitting target. For nothing. It appears that the Nuclear Regulatory Commission grants license extensions for so-called "research" reactors just as automatically as it grants renewals for commercial power reactor licenses. The agency has NEVER failed to give a commercial license renewal -- I believe the current number is 57 out of 57 requests. They've granted 100% of the requests for onsite dry fuel storage, as well -- nearly 40 of those have been issued so far, despite well-documented cases of fraud in numerous parts of the dry cask fabrication industry here and abroad! But on and on it goes. Where WILL it all end? It will end in accidents and fury. The author began studying nuclear issues around the time he was briefly at PSU, in the 1970s. After over half a century of operations, the oldest research reactor in the USA has been licensed to operate for a further 20 years. The Penn State Breazeale Reactor (PSBR) first received an operating licence from the US Atomic Energy Commission (AEC) in 1955 and went critical on 15 August that year. Its licence number - R-2 - belies that it was in fact the first research reactor to be licensed by the forerunner of the Nuclear Regulatory Commission (NRC). Licence R-1 was reserved by AEC and granted retrospectively to a reactor at the North Carolina State College which had started up in September 1953 but had already ceased operating by before PSBR went critical. The Carolina reactor never restarted; the R-2 licence for PSBR has never lapsed. Penn State University was one of the first US universities to take advantage of President Dwight Eisenhower's 1954 Atoms for Peace initiative by building its own reactor. The original reactor consisted of a core of plate-type fuel elements mounted in a grid plate, suspended from a movable bridge in an open pool of water. Initially, the reactor's power level was limited to 100 kWt. In 1960, the authorized maximum operating power level was increased to 200 kWt. Then in 1965, the original core was replaced with a TRIGA reactor core and control system. At the time, TRIGA-type reactors had been installed at other facilities but the PSBR was the first existing research reactor to be converted to a TRIGA. The TRIGA core had a maximum steady-state power level of 1 MWt and included a pulse capability allowing a peak pulse power of approximately 2000 MWt. Over the years, the reactor has undergone several modifications including major renovations to the replace the original General Atomics TRIGA control system with a new analogue-digital control system, completed in 1991. The PSBR is the second oldest research reactor operating in the world today. Only the F-1 graphite pile reactor at Russia's Kurchatov Institute, which started up at the end of 1946, is older. The American Nuclear Society recognized PSBR's historical status nearly two decades ago, presenting it with a Nuclear Historic Landmark Award in 1991. Research reactors are generally not used for power generation but instead to provide a neutron source for research or other purposes. They are smaller and simpler than power reactors, and operate at lower temperatures, but like power reactors are still subject to International Atomic Energy Authority (IAEA) safeguards and inspections. The PSBR is used for experimental, research and educational purposes, including student laboratory exercises and operator training. It currently operates for approximately 2000 hours per year, with the reactor critical for between 840 and 1040 hours per year. Penn State University applied for a 20-year licence renewal for the reactor in 2005, the same year the reactor celebrated its 50th anniversary. After a full safety review carried out by the NRC's Office of Nuclear Reactor Regulation, the regulator has ruled that "PSU can continue to operate the PSBR, in accordance with the renewed licence, without posing a significant risk to the health and safety of the public, facility personnel, or the environment." NRC public hearing on NUREG-1437: Ace is (finally!) on YouTube! The video runs about five minutes in length. The most dangerous times for any nuclear power plant are: Initial start-up or during a restart, and during a shut-down, especially an emergency shut-down. Three Mile Island Unit II, for instance, had been in commercial operation for less than three months when it partially melted down. It was only slightly different from, slightly more powerful than, Unit 1, which, today, was relicensed by the same careless Nuclear Regulatory Commission we seek redress from today as well -- for another 20 years -- until April 19, 2034. Some of Three Mile Island Unit 1's parts will be 60 years old when it is finally "retired" -- irradiated, thermally heated, pressurized, chemically embrittled, and cycled on and off hundreds or even thousands of times. The Emergency Core Cooling Systems, mandatory for all commercial reactors, have never actually been tested, and many scientists have asserted that their calculations have indicated the ECCSs may not work when needed. Not only that, but several ECCSs, such as Monticello's, were found to be completely inoperative several decades after installation, and would definitely not have worked. Control rods have jammed, fuel rods have been bent, plutonium has escaped... and one reactor, Davis-Besse, nearly corroded all the way through before anyone noticed! Except maybe the filter salesman. Many of San Onofre's sea-encrusted, rusted, dilapidated parts will be 60 years old, too, if it makes it to retirement age. And with all the NEW parts they are installing at San Onofre right now -- miles of pipes, dozens of pumps, scores of valves, hundreds of new sensors, drum after drum of electrical cables -- there will be new pressures and fluid flows throughout the system, new control mechanisms, and even relatively new, or completely new, operators. People quite a bit younger than the plant itself, who don't know how hard people fought to stop it in the first place. Who don't know that almost all our fears have ALREADY been realized, from cancers in the community because of the plant, to fraud at the plant, to piling nuclear waste problems, to threats of terrorism. Yes, it was all foreseen. 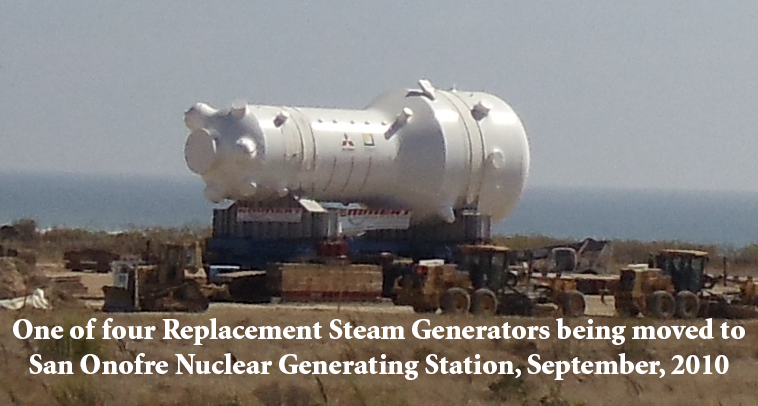 Right now, one by one, each of San Onofre's two remaining operable reactors are being rebuilt, top to bottom. That is, pieces of them are being replaced, top to bottom (even the fog lights, and certainly the sump pumps). But despite the retrofit, vastly more pieces are never being touched, never even being inspected. How much inspection can such a small crew as the NRC leaves "on site" really do? There is only one inspector for every couple of hundred workers. Furthermore, a climate of cover-up still exists at the plant, according to whistleblowers this author has talked to. And no doubt no one from The Shaw Group wants to expose their mistakes, since they are all new at the site and the last group or operators -- Bechtel and their subcontractors -- were fired en masse after about 40 years of running the most dangerous thing on earth, on August 30th, 2009. During the retrofit -- a different division of Bechtel is doing that work -- the danger is probably a lot less than during an average day the plant is running. Criticality is not occurring at the shut-down reactor. Water isn't screaming through the system at enormous velocities and pressures. Lazy, sleepy operators on mood-altering cardiac beta blockers for health problems due to sitting all day long aren't using inaccurate and faulty instrumentation to monitor the whole thing and stop it from melting down. So I'm less scared when the plant is shut down than at any other time. But the restart AFTER this major retrofit will be an especially dangerous time. And then, the continued operation of the plant for 20 more years may well spell doom for SoCal at some point -- for any of a million different reasons. The old welds might start failing, let alone all the new ones that weren't done right, or were done right in Japan or elsewhere in the world, but didn't get shipped properly to America, or broke during installation. And nobody reported anything, because of the climate of cover-up. During the actual retrofit, at least the reactor that is being refitted is not increasing the quantity of spent fuel with nowhere to put it by an average of 250 pounds per day per reactor, as happens each day the reactor is operating (500 lbs per day for San Onofre altogether, when both reactors are running). That's in addition to the tritium which is released and poorly tracked, and the hundreds of pounds per year of noble gases which are not tracked or stopped in any way at all, and the daily releases of radioactive isotopes of all known elements, in varying quantities, as allowed by ALARA. All nuclear facilities vent radioactive isotopes to the public. HEPA filters were originally designed in the 1940s for cleaning the air of radioactive particles but they only achieve a 99.97% success rate (by definition). 3 particles in 10,000 may not sound like a lot, and might have been good enough for The Manhattan Project, but when you are releasing billions of billions of particles every day INTO the filters, it means you are letting a lot of children die in your community DESPITE the filters. And HEPA filters don't work for isolating tritium (a lot more H3 could be removed, but not that way) nor do they do anything to stop the release of the noble gases, which flow right through them. The legal limit for releases of tritium each year by each reactor at San Onofre is about one thirtieth of a teaspoon. Tritium is extremely hazardous, and even this seemingly small amount is way, way too much. And besides, whenever they release more than a thirtieth of a teaspoon, the NRC gives them two special dispensations: One not to say anything, and one not to do anything. So-called "low-level" waste, such as the old steam generators, and the old pumps, pipes, valves, etc., which are being swapped out at the same time as the steam generator replacement project is going on, will be irradiating people, and will get into our children's braces eventually. No reactor should ever be restarted. Period. Shut them ALL down and dismantle / decommission them. All other choices are folly. The author has developed and distributed award-winning educational software for more than 25 years and has customers at over 1000 colleges and universities in over 100 countries. His company web site -- www.animatedsoftware.com -- gets millions of "hits" every month. 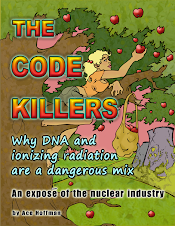 Hoffman has studied nuclear power for about 40 years and wrote approximately 1000 blog entries on nuclear issues prior to authoring The Code Killers in 2008 (and several dozen since). The Society of Environmental Journalists is holding its annual meeting this week, in Madison, Wisconsin. James Rogers, Chairman, President and CEO of Duke Energy Corporation, which owns more than half a dozen nuclear power reactors, will be speaking tomorrow morning (10/9/2009) in "Capital Ballroom B" under the topic: "BIG THINK: Energy Policy in a New Economy." The panel presentation is supposed to discuss how to "set the world on a new, greener path." So what's HE doing there?!? Another member of the panel will be a smart-grid enthusiast, Katherine Hamilton, president of the GridWise Alliance, which supports something I support, namely a smarter and greatly expanded electrical energy grid. But the Alliance works with: "the Union of Concerned Scientists, Natural Resources Defense Council, Midwest Research Institute and other organizations to lobby Congress and statehouses, including Maryland, on various clean energy policies and funding." MRI? Fine, but both the UCS and the NRDC are troubling allies. (The UCS is often referred to in this newsletter as the UUCS ("Union of UnConcerned Scientists" because of statement such as this: "While nuclear waste can be stored safely for the short term (in on-site concrete casks)..." (May, 2009 UCS factsheet.) That's not showing much concern! And the NRDC helps build wildlife "sanctuaries" around nuclear power plants, and that makes them happy. 'Nuff said 'bout them, too.) Hamilton worked with the National Renewable Energy Laboratory, "to put into place several programs mandated in the Energy Policy Act of 1992, including federal energy audit and water conservation programs." So basically, she stays away from worrying about nuclear power. Another panelist is Abrahm Lustgarten, Energy Reporter, ProPublica, former staff writer and contributor for Fortune, who received his masters in journalism from Columbia in 2003, and wrote a book about China with a grant from the John D. and Catherine T. MacArthur Foundation, which supports public radio (PBS), which is the mouthpiece of the government for most things they talk about, and gets most of its money from the government (right now, PBS is getting a grant from NASA and announcing it daily (a VERY pro-nuclear government agency, which has launched dozens of plutonium-238-laden rockets and several small reactors, and some of these "toys" have failed, causing worldwide plutonium dispersals!)). Lustgarten does not appear to be an expert on the dangers of nuclear energy and is also hardly a counterbalance to Rogers. The final panelist, Brian Czech, is a "certified wildlife biologist" who "applies his training and experience to economic issues, especially macroeconomic policy. He has 20 years of experience in federal, state, and tribal governments with duties ranging from firefighting to managing elk herds to developing national conservation policies. Czech is also a visiting professor at Virginia Tech University, where he teaches ecological economics and endangered species policy. A prolific author, Czech wrote the book Shoveling Fuel for a Runaway Train, which calls for an end to reckless economic growth." So basically, he stays away from worrying about nuclear power, too? So it appears. But he's probably plenty worried about "climate change" and "global warming," which nuclear power could be considered a source of, not a solution for, but Rogers will claim otherwise, because "they" always do. And it sounds like everyone on the panel will let him. The moderator, Lisa Palmer, is an award-winning science writer and guess what? I can't find anything negative she has ever had to say about nuclear power! Will questions from the audience make this event memorable? Palmer can ensure that doesn't happen, by, for example, letting each of these panelists make long-winded statements about how damaging global warming is to plant and animal species all over the world, and how badly BOTH expanded nuclear power AND most (but not all) green energy solutions need a better energy grid to be viable options (but not the same grid: The renewable one is more distributed, and thus, much more resilient). It does not appear that anyone on the panel will be qualified, or interested in, grilling The Big Guy (Rogers, he's everywhere these days, he must have a fast jet at his disposal, I hope someone will ask him how he got there) about what HE knows about how tritium damages a fetus. Nothing, he's an executive, not a doctor, he'll say. You know it as well as I do. No one on the panel will be asking Rogers what he expects to do with the nuclear waste his reactors have already created. It's well over ten million pounds of nuclear waste -- all his! He's been saying, "Yucca Mountain" for years (as have them all), but what does he say now? Reprocessing? That's even yuckier that "Yuckie" Mountain! No one will ask what he expects to do with the waste from the new nuclear reactors he wants the government to build for him. That's us, folks, the common taxpayer, who will pay for his nukes (and his waste)! (And not to mention, his ratepayers, too, will pay particularly dearly for these things.) And that's after the government finishes paying billions of dollars to foreign-owned companies with American names (such as "Westinghouse" and "GE") to cover the costs of designing the new nuclear reactors. If they only allow a few questions, it will surely be quite a whitewash. And, of course, with Palmer moderating the questions from the audience, there's no reason to expect the truth to be exposed even if they allow a thousand questions (in the 75 minutes allotted to this important topic). It's unlikely that the rate hikes that are inevitable if Duke continues to be a nuclear-focused company will be realistically expressed. It's extremely unlikely the circular cracks in the flanges (they call them "nozzles" for some reason, but let's pray they never BECOME "nozzles") at the Oconee reactor (owned by Duke) will be discussed. These cracks went nearly all the way around some of the control-rod flanges (they call them "nozzles" but God forbid...). IF the cracks had gone just the least little bit further around it could have -- would have -- resulted in a MELTDOWN. Oops, Mr. Rogers, there goes the neighborhood! And the state it's in, with it (South Carolina)! It is a shame to see a sham at the SEJ annual meeting, but I think that's what the environmental journalists in the audience should expect. In reality, nuclear topics should fill the agenda this year at the SEJ meeting. And real experts should be speaking, not just industry blowhards and their sycophants, so that the journalists can learn more about the topics they plan to write about, instead of just learning what the party line is, as if that's news. From NIRS: Dems caving on nukes in climate bill? Act Now! Your actions are more important than ever, as the push for more nuclear power subsidies in the Senate climate bill intensifies. Now that the Kerry-Boxer climate bill has been introduced, the nuclear industry is intensifying its efforts to turn the bill into a multi-billion dollar giveaway for new reactor construction, dirty and dangerous radioactive waste schemes like reprocessing, further "streamlining" reactor licensing proceedings, and the whole industry Christmas wish-list. Yeah, right... Expanding oil drilling isn't exactly the best way to reduce carbon emissions--and neither is nuclear power or "clean coal," another pet cause of these Senators who won't vote for a climate bill in any case. What they're really trying to do is lard the bill with so much taxpayer giveaways to their favorite dirty energy interests that no one should vote for it. Unfortunately, some of the bill's backers are listening to the nuclear lobby. Read this article posted on the NY Times website yesterday. No matter where you stand on the climate bill itself, and our constituency seems fairly evenly divided between "against it," "for it, with reservations" and "wait and see what's in the final bill," we can all agree that the bill must not become a multi-billion dollar bail-out for the nuclear power industry. Please send a letter to your Senators today. You can send an e-mail, fax, or both. Please plan to call both of your Senators on National Don't Nuke the Climate Call-In Day, Thursday, October 15. It doesn't matter where they may stand on the issue--they need to hear your voice. Let's keep those phones ringing from dawn til midnight on October 15! Capitol Switchboard: 202-224-3121. Please forward this Alert as widely as possible. Print it out and take it to meetings, post it at neighborhood food co-ops and other progressive venues, please do everything possible to spread the word. Organize protests at your Senators' district offices. Write letters-to-the-editor: Senate offices read them! The backroom deals are being made now. It's never been more important for us all to take every action possible. *Again: please send a letter to your Senators today. *Please call your Senators on October 15, and start now to organize your friends, neighbors and colleagues to join you. Plan call-in gatherings at your house, a local pub or restaurant, a park--wherever it's easy for people to join you. *Please forward this Alert and do everything possible to reach out to people who may not be on this list. *If you haven't donated recently, please make a small contribution now and help us expand our outreach during this critical period. Faxes are more effective than e-mails, but we do have to pay for them; your contribution will also help us pay for the thousands of faxes that we hope everyone will send! Together, we can stop this nuclear madness and build the nuclear-free, carbon-free energy future our planet and our people need. The location of this morning's earthquake off California was not more than about 45 miles out to sea from San Onofre Nuclear Generating Station, where about five million pounds of high-level radioactive used reactor cores (aka "Spent Fuel") is currently being stored and about 500 more pounds are being created every day the reactors are running. Right now, one of the "SONGS" reactors is undergoing multi-billion-dollar repairs and is closed. It should be PERMANENTLY SHUT, not "fixed" (patched up with toilet-paper and spit, wrapped up with bailing-wire and coat-hanger wire, duct-taped, and turned on again). AVALON, Calif. ­ A magnitude-3.8 undersea earthquake has struck near the Channel Islands off the southern tip of San Clemente Island. The U.S. Geological Survey says the tremor occurred at 8:31 p.m. Wednesday about 31 miles southeast of San Clemente Island and 43 miles south of Avalon. The USGS Web site reported that very light shaking was felt in some Orange County communities, including Newport Beach and Huntington Beach, but police there said they received no calls about the quake. AVALON, Calif. (AP) ­ A magnitude-3.7 undersea earthquake has struck near the Channel Islands off the southern tip of San Clemente Island. >"$18.5 billion in loan guarantees can leverage loans far in excess of that value." He added that the maximum amount of "LG" is 80% of the cost of a nuke. The basic concept is that someone other than the federal government will loan the extra billion (if the lowest of the two ridiculously low industry estimates Talley gave of $5 billion is correct) or the extra $4 billion (if my estimate of $20 billion for a new nuke started today is correct). Either way, it isn't easy to get loans for a billion dollars these days, even if someone knows a gung-ho pro-nuclear government has provided an additional $4 billion to throw away on the risky venture. So one question is: By proposing doubling the amount of money available for loan guarantees, is Secretary of Energy Chu expecting to start more than the 4-5 nukes the original $18.5 billion was for? Or is he just upping the ante for those first few, because he realizes they'll actually cost a lot more than he thought? Talley didn't know. Chu didn't say. From the utilities' standpoint, the biggest stumbling block for new nuclear construction at the moment appears to be spent-fuel-related. With Yucca Mountain not technically on the horizon (though not "killed" altogether, by any means), the government isn't willing to make the dumb deal it made back in the 1980s, when it promised to take all the used reactor cores away and magically make them disappear. Needless to say, it wasn't a dumb deal for the utilities and they ALL -- every one that is operating today -- signed on. The government would take the highly radioactive -- and pyrophoric -- used nuclear reactor cores and manage their long-term care. That's "long-term" as in: Longer than the United States has existed as a country, times a thousand. It hasn't worked out that way. The government hasn't taken the waste, and you can blame politics all you want, but the real reason it hasn't worked out is the physics make it impossible for a "safe" repository to exist. Someone will ALWAYS have a legitimate gripe against ANY plan. It's the nature of ionizing radiation that it will break down any container made of any material, as it irradiates the container. Microbes won't "eat" radiation away for us. Each little atomic breakdown has all the strength, per alpha particle, beta particle, or gamma ray, of the alpha particles, beta particles, and gamma rays of a nuclear bomb. A nuclear decay is an unstoppable force. Its direction cannot be predicted or controlled. It has an average energy level within a statistically-definable range of probable values, according to various laws of sub-atomic particle physics. The precise moment of any particular decay is also unpredictable. No place on earth is safe to hold the waste. No place can be guaranteed not to have ANY of the following, to start a long list: Earthquakes, tornadoes, floods, tsunamis, jet crashes, terrorists, sloppy construction, or poor design. If all else goes well, any location could still be hit by an asteroid. Why doom the whole earth for one small asteroid? And then there are the transportation problems. The last DOE solution I saw had about 98 wheels and was just a drawing. It looked like a lumbering terrorist's target to me. They don't really know what they are going to do. No country has ever "solved" its nuclear waste problem. France grinds stuff up, releases much of it directly into the North Sea, and stores the rest with no idea of what to do with it. (A tiny fraction is reused, so they call the whole thing "recycling".) Here in American we just let it sit in scores of deadly sites all over the country. Meanwhile, the government is already being sued by about a dozen nuclear power companies, asking for permission to stop putting money into the used-reactor-core-storage fund, and to get back some of what they've already put in! The rest are watching closely, like a pack of vultures. New nuclear power plant loan guarantees don't come with promises to take the spent fuel. And THAT's the real financial hang-up for new nuclear construction in America. But the nuclear industry is working HARD to get around that with help from -- seriously! -- French espionage, infiltration, subversiveness, and other covert and overt actions. That's right: The French intend to get American suckers (that's you and me, folks, the American taxpayer) to pay French-government owned and/or managed firms (EdF and/or AREVA) to build and operate expensive NEW reprocessing plants here in America! And open new (and old) uranium mines, new milling operations, and so on. They use agent-provocateurs, subliminal messages in their advertisements, covert lobbying and funding of politicians... and in other countries where these two "corporations" do business, they behave even more illegally! Reprocessing would theoretically "solve" the fuel problem for the utilities, including slowly eating into their current backlog of millions of pounds of commercial nuclear power-plant high-level radioactive waste. but "theoretically" is one thing, and realistically is another. What reprocessing really would do is cost another hundred (or two hundred) billion dollars and pollute the entire planet, killing people and causing health effects as if we are all expendable, as long as no one can prove for certain where any particular cancer, leukemia, heart disease, birth defect, etc. came from. And burn enormous quantities of fossil fuels in the process, causing thousands more deaths. Reprocessing of nuclear waste is chemical-intensive, too. But it's the only thing that could possibly allow a dying industry to keep going. The current fleet of operating plants is running out of options for waste storage. None of the plant's owners want to have to shut down for lack of storage space, but it might happen. As long as someone will take the waste from you later, operating a nuclear power plant is a "great" way to make money -- like stealing candy from a baby (and giving them cyanide to play with in return). In addition to the waste problem and the insurance problem -- the former unsolvable and the latter solved by government fraud -- there are still the costs and delays of construction. Offshore wind power, solar power, energy conservation and other solutions can be brought online virtually immediately -- by the time a permit for a new nuclear power plant is granted, especially a new design, you could have thousands of megawatts of renewable energy up and running. And the new nuclear power plant, which may well cost close to -- or more than -- $20 billion dollars if construction started today -- will have faulty parts, faulty welds, faulty pipes, faulty concrete, faulty wiring, faulty instructions, workers sleeping on the job, fire crews not knowing what to do when there's a fire, exploding transformers, leaky steam generators, and thousands of other problems. These are the day-to-day facts of life at ANY large facility (but these examples are taken strictly from Nuclear Regulatory Commission records). Most large industrial facilities won't kill millions of people if and when they fail. Most industries are not running on the edge of a mega-catastrophe 24 hours a day, seven days a week, as nuclear power does. Every nuclear construction project now involves hundreds of companies in dozens of countries, each with their own level of oversight for worker safety and for quality of their output. Each has different ethics about what "quality" means, and what the punishments are for shipping shoddy work half-way around the world where its shoddiness won't be discovered for decades, until the part fails at a critical moment, causing a meltdown, and all the evidence is destroyed. Fraud has always been rampant in nuclear construction and operation, and continues with the new international trade agreements, where even so-called "American" companies such as GE and Westinghouse are really just fronts for, in those cases, Japanese corporations, and where both EdF and AREVA claim in America that they are as American as apple pie, just because the heads of the American divisions are American. ..."For more than a year, the city has been drifting, in multi-million-dollar installments, into a second helping of nuclear power from the South Texas Project nuclear facility outside Bay City. "For the last hour, the talk has idled at intersecting concerns over whether Toshiba can deliver two Advanced Boiling Water Reactors to STP on time and on budget; whether renewable energy sources could become cost competitive with nuclear by 2020, when San Antonio will really need the extra electricity; if CPS Energy's price estimates for alternative energy sources, such as natural gas and efficiency, are even close to accurate. "While the Congressional Budget Office wrote in 2003 that 'well above 50 percent' of federal nuclear-power loan recipients will default because of 'technical risks' and high construction costs, Bartley tells the audience that CPS had its proposal screened by Fitch Ratings and were told the utility should be able to maintain a Double-A credit rating through the life of the reactors. " Following the 10th September '09 verdict on the death of Stuart Dyson, Robin Balmain, a Coroner in the Black Country Coroner's District in Smethwick, UK, has written to the Secretary of State for Defence, Bob Ainsworth MP. The Jury in the inquest into Mr. Dyson's death found that he had been exposed to Uranium during his service in Iraq during 1991, and that the Uranium caused or contributed to the colon cancer which finally killed him in 2007 at the age of 39. The expert witness at the inquest was Professor Chris Busby, Scientific Secretary of the European Committee on Radiation Risk, who presented evidence of the inadequacy of the radiation risk model advised by the International Commission on Radiological Protection. The Ministry of Defence failed to send either legal or scientific representatives. Mr. Balmain writes that "action should be taken" since the use of Uranium weapons creates "an obvious risk to service personnel" which "equally applies to civilians in areas of conflict." For over a decade the Low Level Radiation Campaign has stated that use of Uranium weapons is contrary to international law because of their indiscriminate effects. "Where the evidence gives rise to a concern that circumstances creating a risk [that] other deaths will occur, or will continue to exist, in the future and in the coroner's opinion action should be taken to … eliminate or reduce the risk of death … the Coroner may report … to a person who the Coroner believes may have the power to take such action." Rule 43A requires Bob Ainsworth to reply to Mr Balmain within 56 days. Report on verdict at www.llrc.org/du/subtopic/dysonverdict.htm including full copies of written submissions from Professor Busby and MoD.